This week's game comes from the Colorado Springs Chess Club's Tuesday night event, The June Swiss 90 (4SS, G/90+30). It was a four-round, month-long event with one game per night. Typically, Brian Rountree gets his money's worth on time, as he is one of the last games to finish. However, this night, he was the first game done. The reason he finished so quickly was that his game ended in 9 moves. A single digit game is a rarity in tournament chess. Very few games finish in under 25 moves, and those games have been given a special name: miniatures. I have no idea what a single digit game is called. But they do happen. I have played in over 900 tournament games. I searched my database for games that finished in less than 10 moves and found 3 games. One was 9 moves where my opponent dropped his Queen and resigned. The next was 1 move because my opponent didn't show up. The last one was a 4 move checkmate from the editor of my state's chess association, who promised a loss to anyone who submitted an article. Of course, my numbers may not be the best example of how often single digit games occur, as I don't often play the new or less experienced players. So, I checked my TD database. It has 523 games, and I found 6 games with 9 moves or less. One percent. You are in rare company to be a part of a single digit game. You are apart of the 99th percentile. However, I noticed that it is even more rare to win as Black. All of the single digit games I found were won by White (Peter Barlay had 3 of them). Until now. 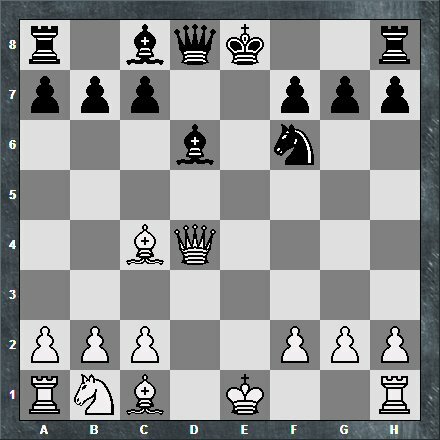 On June 27th, the Colorado Springs Chess Club finished the June Swiss 90 (4SS, G/90+30).